Are you getting enough vitamin D? If not, your bliss may have been zapped right out of you since vitamin D deficiency is linked to chronic fatigue. But that's just the tip of the iceberg. Many Americans are deficient in this vital nutrient and studies show that women, children and the elderly have the lowest levels of all, often dangerously low. I used to be one of those vitamin D deficient women. Well, it goes beyond strong bones, which is what most people associate it with. Vitamin D is actually crucial to the optimal health of all 36 organs in your body, which means it can have an impact on numerous diseases. 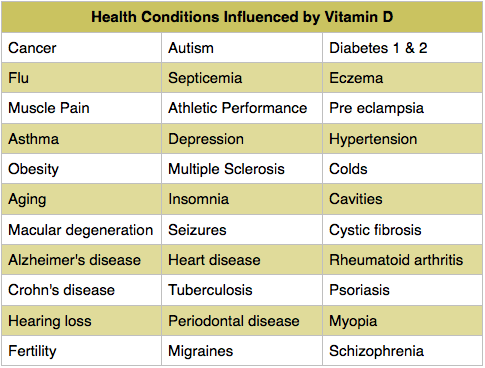 Check out this list of conditions affected by vitamin D. This is astonishing to me! Anthony Norman, international expert on vitamin D, published a paper in the American Journal of Clinical Nutrition where he sites the importance of the nutrient on the immune system, insulin regulation, heart and blood pressure regulation, muscle strength and brain activity. Vitamin D is technically not really a vitamin at all, but a hormone that your body naturally produces from exposure to sunlight. Just as with other hormones, when it is out of whack, your health suffers the ill effects. There are at least two significant reasons for the decline of vitamin D in the average American body. Lack of Sun Exposure The sun is the best source of vitamin D there is. While technically not a "source" of vitamin D, sunlight provides your body with the ability to make it. Yet in the past few decades we've been repeatedly warned to stay away from the sun for fear of cancer, when in fact adequate amounts of sun exposure can actually prevent cancer. And when we do get some sunshine, we slather on chemical laden sunscreens, most of which . . . guess what . . . cause cancer. According to Andreas Moritz, author of Heal Yourself With Sunlight, sunscreen is now the leading cause of skin cancer. Go figure. So while we're avoiding the sun for fear of cancer, we're not only still getting other forms of cancer, we're causing a host of other ailments as well. More than a million people are literally dying every year because they are staying away from the sun. Dairy Allergies & Lactose Intolerance In the 1930's commercial milk manufacturer's began fortifying milk with vitamin D to avert a rickets epidemic, an ailment that ravaged children with devastating skeletal consequences. In our modern era the onset of milk allergies and lactose intolerance has caused many to avoid consumption of vitamin D fortified milk. Yes! Contrary to popular belief, exposure to sunlight is not only safe in moderation, but extraordinarily healthy. While burning is definitely harmful, there are no studies that prove that proper sun exposure causes cancer. When built up safely, over time, a nice tan is the best sunblock you can have. My mother is a testimony to the healthful effects of the sun. After losing two babies at 5 and 6 months of pregnancy, she turned to the sun the next time she was with child. She made a point to soak up the sun's healthy rays and was able to carry my brother to term followed by me. That was in the 60's and no one told her to do this . . . she just felt compelled to. However, studies have since shown that vitamin D is quite important for pregnant women. Not only is it valuable for the health of their baby's bones, but vitamin D deficiency has actually been linked to miscarriage.So, way to go mom! You done good. The simplest and most concise answer is to expose as much of your body as possible to the sun for as long as it takes for your skin to turn the lightest shade of pink (assuming your ethnicity allows you to see the change in color). After this point your body will not make any more vitamin D and further exposure can become harmful. For one person ten minutes might be all their fair skin can tolerate, while someone who's skin is used to the sun can be exposed at length with no adverse effects. Dr. Mercola discusses safe sun exposure in detail. I'm naturally fair skinned. When I'm not used to sun exposure, depending on time of year and time of day, I can go somewhere around 15 minutes before turning pink. If I'm laying out I'll set a timer, turn over after the allotted time and then set the timer again. I can't really tell how pink I am until some time after sun exposure, so I start with a shorter timeframe, examine my skin later and adjust my next exposure accordingly. The more color I get, the longer I can be in the sun and the more vitamin D my body can make. Studies have shown that lifeguards, farmers and those who spend large amounts of time in the sun generally have superior amounts of vitamin D. Anyone who has developed cancer after a lot of time in the sun most likely got it from burning or from the chemicals in their sunscreen. Once you get enough sun to turn pink, you need to cover your skin with clothing or an all natural and safe sunscreen. When you've had enough sun, don't slather on toxic sunscreens that actually cause cancer instead of preventing it. There are hundreds of natural sunscreens on the market that are rated safe when absorbed into the body by the Environmental Group, but the trouble is sifting through them and finding one that works well and doesn't leave you looking like a ghost and feeling pasty. The Blissful Miss List of Best Natural Sunscreens combines EWG safety ratings with Amazon reviews to compile a list of natural sunscreens you can trust. While consistent sun exposure or a tanning bed are the most optimal and safest ways to get vitamin D, if neither are reasonable options for you or not options during the winter months, then oral vitamin D3 supplementation is really your only realistic alternative. Be sure to only take D3, as this is the natural form your body makes when exposed to the sun. Avoid the synthetic and quite inferior D2 supplement and never take oral vitamin D3 haphazardly. A person who does not take oral vitamin D supplements, but has a dark tan has around 100 ng/ml. Those who optimize their vitamin D through sun exposure are never at risk of overdosing as the body self-regulates and only makes what it needs. I was surprised to learn that a "safe" tanning bed is actually the second best way to optimize your vitamin D levels. This creates a viable option for those who live in areas where regular sun exposure is difficult to achieve, or don't get sunshine year round. But not just any tanning bed. You must use one with electronic ballasts, as opposed to magnetic ballasts, which expose you to harmful EFS fields. Safe tanning beds also have less UVA, which is dangerous. If you choose to buy a tanning bed or use one at a tanning salon, do your homework and make sure you are using a truly safe tanning bed. Solar Wave and Solar Storm, both sold on Amazon, have electronic ballasts. The only way to know your levels of vitamin D is to test for them. You can do this through your doctor or simply order a test online to perform at home and mail to a lab. Be sure the test you use is a 25(OH)D test, also called 25-hydroxy vitamin D. And be advised that some states, such as California, do not allow vitamin D testing without a doctor's order. Click here for more detailed information on safe sun exposure from Dr. Mercola. Ensuring you have optimal levels of vitamin D is one of the best things you can do for your health. So find your bliss, live well, and be fabulous by ensuring you don't neglect this extremely important vitamin . . . er hormone.